Apple brought a lot of display variations in the past couple of years, ranging from multi-touch to 3D Touch panels. Moreover, it’s no brainer that Apple files a lot of patents, regardless of the company’s attempts to implement it right away. Similarly, the Cupertino camp has filed a new patent for a display that deems to recognize hovering fingers for unique gesture. Most probably the application by hovering actions would be unique as well. The patent has been published by the United States Patents and Trademark Office this week by the name of ”Proximity and multi-touch sensor detection and demodulation”. It describes the method by which the proximity sensing hardware can be used to recognize the fingers hovering above the display panel. According to Apple, the combination of photobodies and infrared LEDs with capacitive sensors can detect or recognize the nearness of fingers with the display. This will be registered to the display by the light bouncing off the fingers. The deviating light bouncing off the fingers can also help the panel to differentiate between an individual’s finger or even the entire palm. It’s not like the hovering gesture technology is unknown in the mobile world. Many other smartphone manufacturers such as Samsung have already implemented it in its Galaxy S lineup. Nonetheless, we don’t even know when might Apple implement it because the company is reported to file a lot of patents and not all of them are implemented spontaneously. Apple’s plan for the technology is to implement it in its future products, including the iPhone and other devices running iOS. Moreover, the company also has plans to implement the technology in Macs. 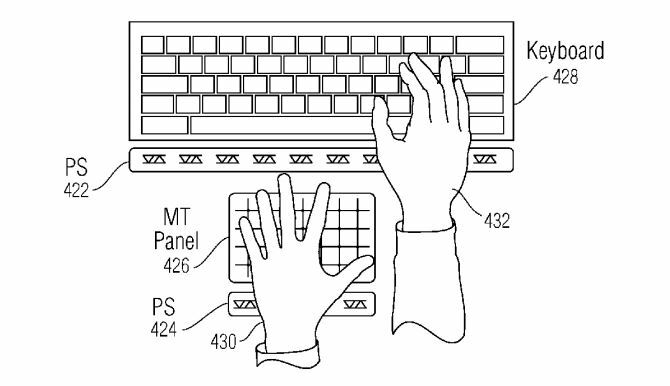 The hover gesture technology can be used to interact with different elements on the screen including virtual buttons. For instance, hovering your palm over the display can allow your iOS device to switch apps, while the hovering finger swipe could allow you to flip pages in specific apps and so on. As we have mentioned earlier, the patent only reveals what the company is interested in. It does not necessarily mean that Apple might include this specific feature in the forthcoming iPhone or any other iOS device. This is it for now, folks. What do you think about this patent? Do you think the existence of hover gesture technology might be a little confusing alongside 3D Touch or multi-touch? Share your thoughts in the comments.